Traditionally, heat damage in forages has been associated primarily with alterations in forage protein quality as a result of Maillard reactions. A Maillard reaction is a heat-induced chemical reaction between protein (amino acids) and sugars. Maillard products produce a range of odors and colors in forages, but generally are poorly characterized nutrients in ruminant nutrition. Terms such as heat-damaged protein, available protein, and acid-detergent insoluble protein have been used to characterize heat damage in forages for decades. Recent research offers new and broader perspectives in regard to the effects of heating on forage quality. This Focus on Forage will highlight new perspectives on how heating effects forage quality. Standing forages contain an abundance of epiphytic microorganisms such as bacteria, yeast and molds. An epiphyte is simply an organism that grows upon (or attached to) a living plant, and epiphytic bacteria are common on all harvested forages. Epiphytes can be divided into two simple groups, those that require oxygen (aerobic) and those that do not (anaerobic). Anaerobic epiphytic bacteria are in part the class of bacteria that ferment silages. Desirable silage is produced as a result of anaerobic fermentation. When forages are conserved as silage, baleage, or dry hay, air (oxygen) is always entrapped within the crop. In normal silage production, aerobic bacteria, yeast and molds coupled with plant respiration quickly consume all free oxygen and replace it with carbon dioxide initiating anaerobic fermentation. Dry hay is typically baled at very low moisture contents and aerobic epiphytes are unable to survive. When hay is baled too wet, or conversely when forages are ensiled too dry, a pseudo-fermentation environment exists. The forage contains adequate moisture for aerobic epiphytes (and other external microorganisms) to grow, but excessive oxygen is entrapped within the forage mass extending the aerobic phase over days or even weeks. Under these conditions soluble carbohydrates from the forage are consumed by aerobic microorganisms producing carbon dioxide and heat. Initial heat production produces secondary environments for other types of microorganisms, including thermophilic bacteria, and the temperature within the forage mass can cyclically rise. Some aerobic bacteria, such as Actinomycetes, are thermophilic and can grow at temperatures >120°F. Respiratory activity of microorganisms can cause internal bale temperatures to rise to approximately 160°F; however, as internal bale temperatures reach this level, microbial activity normally ceases. Further temperature increases are largely driven by oxidative (nonenzymatic) reactions that are poorly understood. Within any given bale type, the moisture content of the forage at baling has the greatest impact on the severity of heating during storage. This concept is illustrated in Figure 1 for small-rectangular (80 to 100-lb) bales of alfalfa baled over a wide range of moisture contents. In Figure 1, heating is measured as heating degree days >86°F (HDD), which is similar to the growing degree day concept used by agronomists. Generally, HDD integrates the magnitude of the internal bale temperature over the time period during which bale temperatures were elevated. To calculate HDD, 86°F is subtracted from the maximum internal bale temperature for each day of storage. The daily differential is then summed for each day that the difference was >0. On days the internal bale temperature remained <86°F, a value of 0 HDD is assumed. There are two important concepts illustrated by Figure 1. First, the relationship between moisture content at baling and spontaneous heating is positive and (in this case) linear. 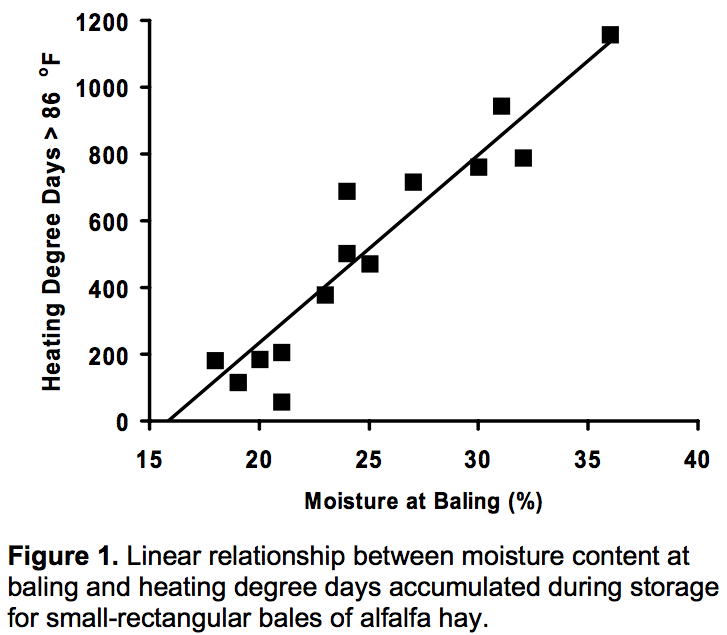 Second, the variability of data points around the regression line is quite limited, indicating moisture content at baling is the primary factor driving spontaneous heating. Another factor impacting the severity of heating in baled hays is the size and/or density of the bale package itself. Generally, heat generation potential of forage DM is independent of bale size; however, larger and/or denser packages contain more DM within each bale. Larger bale packages also have less surface area per unit of forage DM, which impedes heat dissipation. 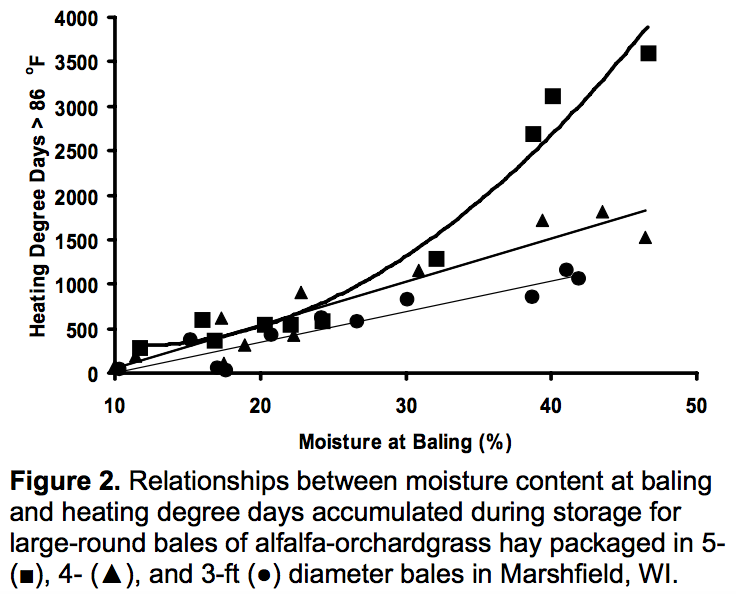 The combined effects of moisture content at baling and bale size are shown in Figure 2, which summarizes heat accumulation within large-round bales of alfalfa–orchardgrass hay packaged in 3, 4, and 5-foot diameter bales. As observed for small-rectangular bales, the HDD accumulated during storage increased with moisture content for each bale diameter. However, as bale diameter increased, large-diameter bales were more likely to exhibit spontaneous heating at relatively low moisture contents (<20%), and accumulate more HDD during storage. Larger-diameter bales also pose an increased risk of spontaneous combustion. How does heating effect forage quality? Heat damage in forages is often viewed in binary terms, meaning that the forage is either heat damaged, or it is not heat damaged. In reality, the effects of heating on forage quality are not binary, but are better described as a continuum. Most producers and nutritionists are familiar with the concept of heat-damaged protein (discussed below); however, this is not necessarily the most important negative consequence of spontaneous heating. Figure 3 describes the relationship between concentrations of forage NDF and HDD. Concentrations of NDF increased by as much as 11 percentage units as a result of spontaneous heating, but it is important to note that NDF is not really generated during the heating process. Increases in NDF concentrations occur because cell solubles (most specifically, sugars) are oxidized preferentially during microbial respiration. Fiber components, such as NDF, ADF, and lignin, are generally inert during this process, but their concentrations increase because cell solubles are reduced due to oxidation. This is particularly important because sugars and other cell solubles are essentially 100% digestible, while fiber components are not. 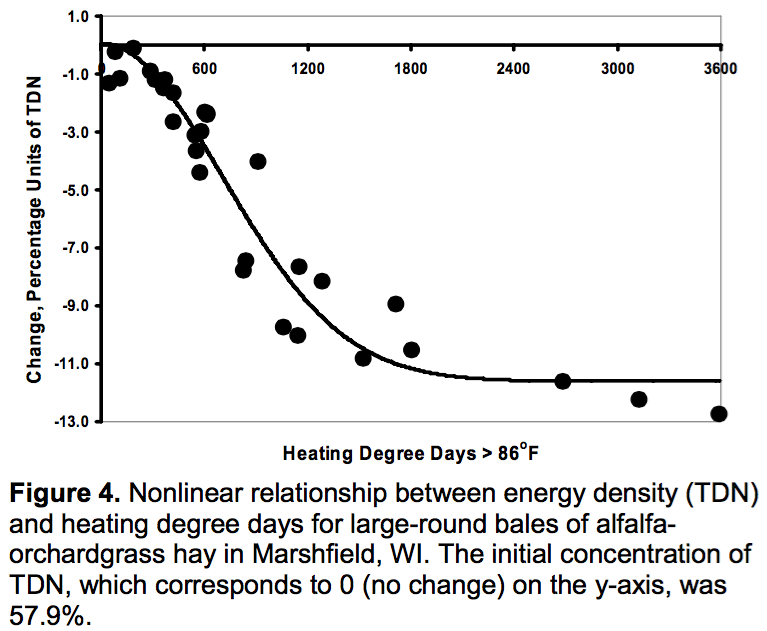 As a result, spontaneous heating decreases the energy density (expressed as TDN) of the forage (Figure 4) . Many nutritionists hold the view that NDF digestibility is reduced as a result of spontaneous heating. Surprisingly, results from studies suggest NDF digestibility is not significantly altered by heating unless heating is severe enough to cause charring, which appears as black or dark brown pockets within the bale core. 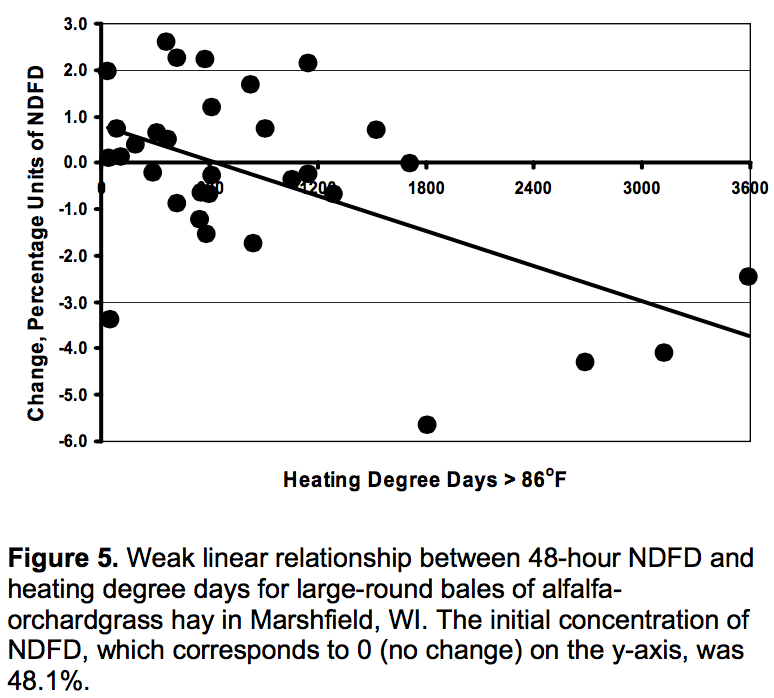 When extreme cases of heating are excluded, there is little evidence that NDF digestibility (measured as 48-hour NDFD) and HDD are related statistically (Figure 5). How can heating be prevented? Traditionally, the threshold moisture level for acceptable storage for small-rectangular bales has been about 20%. As larger hay packages become more popular with producers, it is important to reduce this threshold moisture level to limit heating. A good target window for large-round or large-square bales would be 16-18% moisture. It often is easier to attain even lower moisture at baling with grasses, which dehydrate more easily. 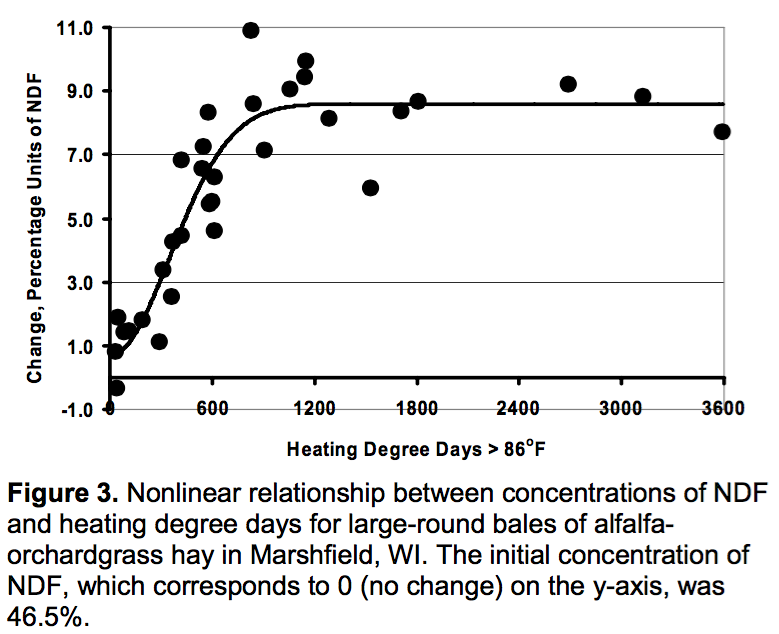 Although some heating will occur in large hay bales when they are packaged within this range and stored outdoors (Figure 2), the associated effects on forage quality are relatively minor (Figures 3-6). Is the laboratory test for heat damaged protein still valid? Tests for heat-damaged protein in forages are expressed in many ways by commercial forage testing laboratories. Commonly used terms are acid detergent insoluble protein (ADICP), acid detergent fiber crude protein (ADF-CP), acid detergent insoluble nitrogen (ADIN), heat-damaged protein (HDP) and insoluble crude protein (ICP). In general, these measurements represent the same nutrient. In many cases, they are reported as a percentage of total CP, but they also can be reported as a percentage of forage DM. Arguably, the best definition is acid detergent fiber crude protein (ADF-CP) because the actual laboratory test measures the amount of crude protein retained in acid detergent fiber. Historic benchmarks suggest that if this fraction comprises <10.0% of the total forage CP, then minimal heat damage has occurred during storage. It is important to note that all forages contain some ADF-CP; in unheated hays, this probably comprises 4 to 8% of the total CP. 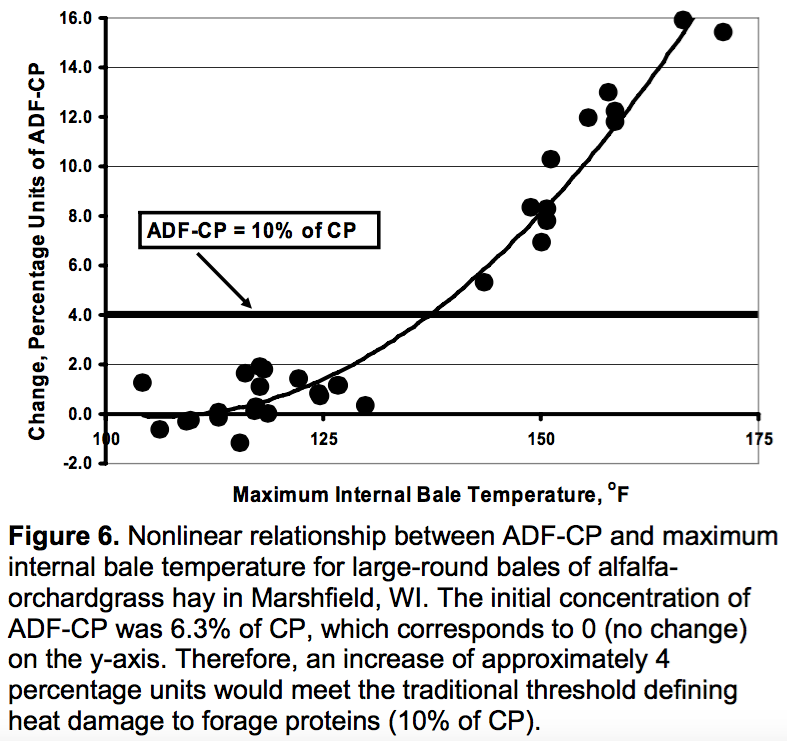 In native (unheated) forms, CP in ADF is largely indigestible within ruminants, but some research suggests that CP in ADF produced as a result of spontaneous heating may have low bioavailabilities. Recent research (Figure 6) indicates that traditional guidelines defining heat-damage to forage proteins are reasonable, but concurrent reductions in energy density may be the most serious consequence of spontaneous heating.